Do you ever get confused when it comes to philosophy and worldview? I do. I’m not saying that I’m doubting my faith. Nor am I struggling with what I believe. I would never leave the one who set me free and gave me meaning. I will never understand it all – The world, philosophies, ideas and so on. I get confused. Unable to be still and at peace. When that happens, I need to just come back to what I know, leave things in the hands of my more-than-competent creator, and realize that I am an individual – unique, cherished, precious, lovely – in the eyes of He who carefully crafted me and breathed life into my being. Oh to be like a child. Do you ever get confused with the myriad of ideas and philosophies floating around out there? I do not get confused on my beliefs, I get confused when folks play rhetorical games with me, sometimes, sometimes God gives me the means to say what needs to be said when I don’t get in the way. I hear you. I am a very strong feeler, and my experiences with God have been very intimate and emotional. Being married to a very strong thinker has helped me be more balanced, thank God. When I get frustrated or confused or have questions about something that I can’t seem to grasp, I ask him. Oftentimes it’s like a breath of fresh air. All of a sudden everything makes sense. He’s been traveling, but returns today. Believe me, I have a lot I want to talk with him about. But apart from that, it’s not that I’m confused, so to speak, it’s more like trying to grapple with the noise of the world, skepticism, heady topics. But as I mentioned in my post, I come to God with all of this stuff and I remember the things that He’s shown me in the past, and I remember how tiny I am, and how great He is. Yes I do. There are times in my confusion that I question who is right and who is wrong. I also question if there is a right or wrong. At the end of the day, these questions give me strength in my core beliefs. These are like the devils challenges in the desert. Hi Rob. I believe there’s right and wrong. I believe there are absolutes too. I know who my faith is in, but being such a strong feeler, and having difficulty at times making sense of the ‘heady’ stuff, it takes a toll on my emotions and stillness. I went to God this morning with it all, and He seemed to point me in the right direction. I just need to drown out the lies and noise that keeps trying to bombard my head. I like that last sentence, “these are the devils challenges in the desert.” I so totally agree and relate. Hugs and blessings, my friend. Hehehehehe. No worries Rob. I’m just playing with you. And striking up conversation. We have good ones, don’t we? That we do, Staci! Yes, and we cover lots and lots of topics, don’t we? I love our conversations!!! Woo Hoo! In Portuguese we say, “Vamos lá”. Basically, “Let’s go”. But with a strong sentiment and excitement. “To be like a child”… profound and accurate metaphor in my opinion, because we are God’s children… yes, we may get “confused with the myriad of ideas and philosophies floating around out there”, but we have to find a “place” or a “state of mind” to focus on our “true self”… and ask “what do I really believe in”, “what do I really think” – and from silence will emerge wonderful answers if we’re able to listen to the voices of the spiritual world. Thank you Staci 🙂 And much love to you! I’m so pleased you commented here. I value what you think. You know, it’s not that I’m confused, so to speak. I know where my faith is and where it lies. However, I am a strong feeler, and at times I find it difficult to deal with a lot of the noise that the world throws at me. Especially the ‘heady’ stuff. Everybody has an opinion, and everybody has their struggles. My struggles are not in whether my faith is in God, Jesus, the Bible, etc. It’s the polemic stuff. That’s why I wrote this about having the faith of a child. Children don’t ever question whether or not their parents will be there for them, or whether what they say is right, or wrong, is in fact right or wrong. They don’t worry if their parents are going to provide for them. They simply go about their lives learning and growing and being influenced by their parents and their surroundings. My highest hope is that I would be influenced by God, my Father. Because ultimately, he holds the keys to all love, wisdom and truth. Ohhhh, thank you so much for your lovely comment. I’m so glad you can relate to this. It really is a gift to have a child-like faith, isn’t it? Ohhhhhh Trini, I can’t believe that I didn’t reply to this beautiful comment of yours until now. Somewhere along the way I missed it. Thank you so much, my friend. I know that you are such a lover of child-likeness. Actually, you shine with that child-likeness and it’s beautiful. It gives me strength to confront the worldviews & ideologies of the times, and learn how best to articulate mine. Thanks Staci for sharing. Hi Timi. Thank you for your kind words and for sharing. I’m not really confused when it comes to my faith, God, the Bible, so to speak. It’s more like the polemic stuff that’s constantly thrown at me. 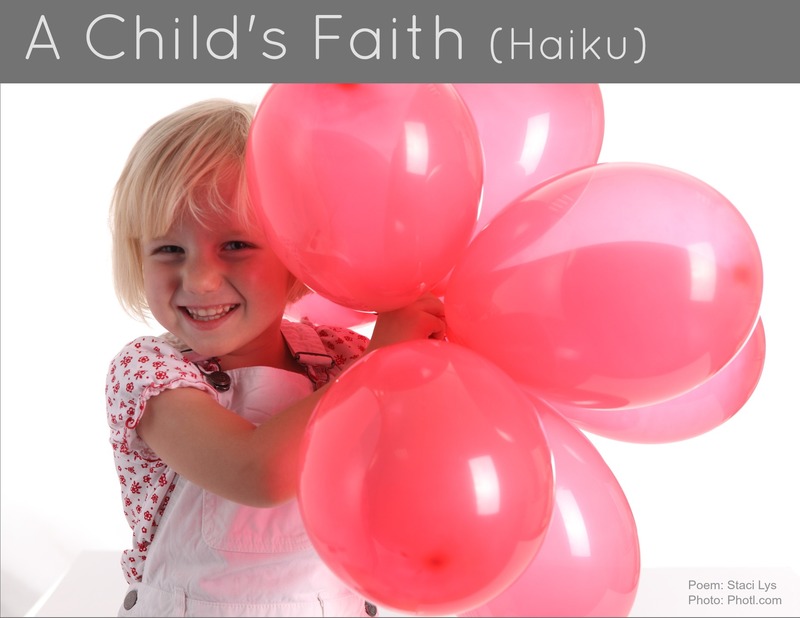 In writing this, I had in mind the scripture that talks about having the faith of a child to enter the Kingdom of Heaven. There are so many worldviews, opinions and ideas floating around out there. Being such a strong feeler, sometimes it seems to cloud my thinking. Just today I was having a quiet time in the morning and I started remembering all sorts of passages I’ve read before and things I feel as if God has taught me in the past. It was like His spirit was bringing to my remembrance the things I needed to remember. I believe the battle is in the mind and my weapons are based on Truth. Thanks again Timi. I love what you said about “learn how to best articulate mine.” It’s so true. These are times of strengthening the faith muscle. Thanks for letting me share my 2 cents. Oh no, I hope I didn’t sound defensive. I’m sorry Timi if it sounded that way. I didn’t think you were trying to way that I was or am at all. No worries ok. I love your comments and how you enrich the conversation. Your 2 cents, so to speak. Thank you so much Neha. You’re too kind. Oh how lovely it would be if we could just be so in tune constantly to His still small voice. What a difference that would make eh. To shun out all of the noise and clutter that is constantly competing for our attention. Hmmmmmm. Often I think the world is just a philosophy of confusion. But there is truth within that confusion. You just have to know where to look for it. Interesting. Oftentimes it seems to just scream at me. That’s when I hide away and pray, and cry, and cry out, and then ahhhhhhh, finally some peace. When I start overthinking things, I remind myself of how children just accept that what will be will be. The biggest thing that Connor and Molly are ever concerned about is what kind of cake they’ll choose at the coffee shop. While we can’t live out lives in ignorance, I think we need to keep hold of the simplicity of thought we had as young and innocent children.